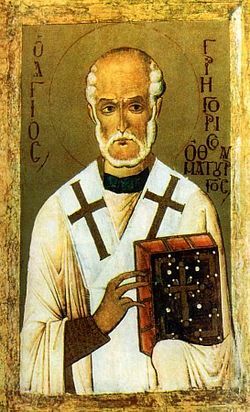 Saint Gregory Thaumaturgos, who lived from about 213 AD until about 270 AD, was the Bishop of Neo-Caesarea. We behold now a great and wondrous mystery. Shepherds with cries of joy come forth as messengers to the sons of mankind, not on their hilly pastures with their flocks conversing and not in the field with their sheep frolicking, but rather in the city of David Bethlehem spiritual songs exclaiming. In the highest sing Angels, proclaiming hymns Archangelic; the heavenly Cherubim and Seraphim sing out praises to the glory of God: “Holy, Holy, Holy…” Together all do celebrate this joyous feast, beholding God upon the earth, and mankind of earth amidst the heavens. By Divine providence the far distant are uplifted to the highest, and the highest, through the love of God for mankind, have bent down to the far distant, wherefore the Most High, through His humility, “is exalted through humility.” On this day of great festivity Bethlehem hath become like unto heaven, taking place amidst the glittering stars are Angels singing glory, and taking the place of the visible sun — is the indefinable and immeasurable Sun of Truth, having made all things that do exist. But who would dare investigate so great a mystery? “Wherein God doth wish it, therein the order of nature is overturned”, and laws cannot impede. And so, of that which was impossible for mankind to undertake, God did aspire and did descend, making for the salvation of mankind, since in the will of God this is life for all mankind. That One, Who did forsake the Angels, Archangels, Thrones, Dominions, and all the constant and luminous spirits — He alone having come a new path, does issue forth from an inviolate of seed virginal womb. The Creator of all comes to enlighten the world, indeed not leaving His angels orphaned, and He appears also as Man, come forth from God. And I, though I see by the New Born neither trumpets (nor other musical instruments), nor sword, nor bodily adornments, neither lamps nor way-lamps, and seeing the choir of Christ composed of those humble of birth and without influence — it doth persuade me to praise of Him. I see speechless animals and choirs of youth, as though some sort of trumpet, resonant with song, as though taking the place of lamps and as it were shining upon the Lord. But what shall I say about what the lamps do light? He — is the very most Hope and Life Itself, He is Salvation Itself, Blessedness Itself, the focal point of the Kingdom of Heaven. He is Himself borne as offering, so that there would in power transpire the proclamation of the heavenly Angels: “Glory to God in the Highest,” and with the shepherds of Bethlehem be pronounced the joyous song: “And on earth peace, good-will to mankind!” Born of the Father, in His Person and in His Being passionless, now in a manner dispassionate and incomprehensible He is born for us. The pre-eternal birth, He alone Who was born dispassionately doth know of; the present birth, is supernaturally known only by the grace of the Holy Spirit; but in both the first birth truly, and in the present birth in kenotic humbling, actually and immutably God was born from God, but He — is also Man, having received flesh of the Virgin. In the highest of the One Father — He is One, the Only-Begotten Son of the One Father; in kenotic humbling Unique of the unique Virgin, the Only-Begotten Son of the one Virgin… God suffereth not passions, in being born God of God; and the Virgin did not suffer corruption, since in a manner spiritual was born the Spiritual. The first birth — is inexplicable and the second — is insurmisable; the first birth was without travail and the second was without impurity … We know, Who now is born of the Virgin, and we believe, that it is He, born of the Father before all eternity. But what manner of birth it was we would not hope to explain. Neither with words would I attempt to speak of this, nor in thought would I dare to approach it, since the Divine Nature is not subject to observation, nor approachable by thought, nor containable by the hapless reasoning. Needful only is to believe in the power of His works. 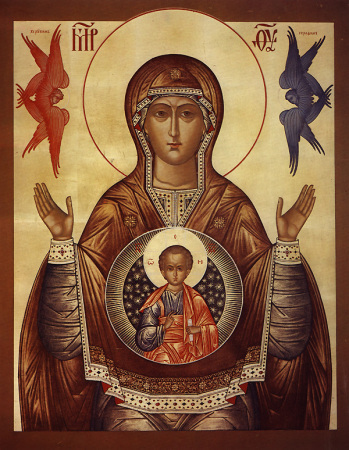 The laws of corporeal nature are evident: a married woman conceives and gives birth to a son in accord with the purpose of marriage; but when the Unwedded Virgin gives birth to the son miraculously, and after birth remaineth a Virgin, — then is manifest and higher corporeal nature. We can comprehend what exists according to the laws of corporeal nature, but concerning that which is beyond the laws of nature, we fall silent, not through fear, but more so through sin-wrought fallibility. We fall silent, in silent stillness to reverence virtue with a worthy reverence and, not going beyond the far limits (of word), to be vouchsafed the heavenly gifts. What to say and what shalt I proclaim? To speak more concerning the Virgin Birth-Giver? To deliberate more on the miraculously new birth? It is possible only to be astonished, in contemplating the miraculous birth, since it overturns the ordinary laws and order of nature and of things. About the wondrous works (of God) one might say in brief, that they are more wondrous than the works of nature, since in nature nothing begets itself by its own will, though there be the freedom thereof: wondrous therefore are all the works of the Lord, Who hath caused them to be. O, immaculate and inexplicable mystery! That One, Who before the very creation of the world was the Only-Begotten, Without-Compare, Simple, Incorporeal, is incarnated and descends (into the world), clothed in a perishable body, so that He be visible to all. For if He were not visible, then by what manner would He teach us to keep His precepts and how would He lead us to the invisible reality? It was for this therefore that He became openly visible, to lead forth those of the visible world to the invisible. Far more so do people reckon their eyesight as more credible a witness than mere hearsay; they trust that which they see, and doubt that which they see not. God willed to be visible in body, to resolve and dispel the doubts. He willed to be born of the Virgin, not to initiate of Her something unneeded and wherein the Virgin knew not the reasons of the matter, but rather the mystery of His birth is an immaculate act of goodness, wherein the Virgin Herself asked of Gabriel: “How can this be, in that I know not a man” — to which She received in reply: “The Holy Spirit shalt come upon Thee, and the power of the Most High shalt overshadow Thee” (Luke 1:34-35). But in what manner did the Word, Who was God, therefore issue forth from the Virgin? This — is an inexplicable wonder. Just as a goldsmith, having obtained the metal, makes of it a thing suitable for use, thus did Christ also: finding the Virgin immaculate both in spirit and in body, He assumed of Her a spirit-fashioned body conformable to His intents, and was arrayed in it, as in clothing. On this wondrous day of the Nativity the Word was neither afraid nor ashamed to issue forth from the virginal womb, nor did He consider it unworthy of Himself to assume flesh from His creation — so that the creation, made the attire of the Creator, should be esteemed worthy of glory, and so that mercy should be made known when revealed, from whence God through His goodness hath descended. Just as it would be impossible for an earthen vessel to appear before it be clay in the hands of the potter, so likewise would it be impossible for the perishable vessel (of human nature) to be renewed otherwise, to make it the attire of the Creator, Who is garbed in it. What more to say, what shall I expound on? The new wonders do strike me with awe. The Ancient of Days is become a Child, to make people children of God. Sitting in glory in the Heavens, because of His love for mankind, He now lays in a manger of dumb beasts. The Impassionate, Incorporeal, Incomprehensible One is taken by human hands, in order to atone the violence of sinners and the iniquitous and free them of their slavery, to be wrapped in swaddling cloths and be nourished on the knees of Woman, so that shame be transformed into honour, the impious to be led to glory, and in place of thorns a crown. He hath taken on my body, so that I be made capable to have within myself His Spirit — He hath appropriated unto Himself (my nature), being garbed in my body, and doth give unto me His Spirit, so that I, giving and in turn receiving, might discover the treasure of life. What shall I say and what proclaim? “Behold, a Virgin in womb shalt conceive and She shalt give birth a Son, and they will call Him the name Emmanuel, in interpretation: God is with us (Matthew 1:23). The saying here deals not with something for future whereof we might learn to hope, but rather it tells us about something that already has occurred and it awes us with something that already has been fulfilled. What formerly was said to the Jews and fulfilled amidst them, is now thus amidst us realised as an occurrence, whereof we have received (this prophecy), and adopted it, and believed in it. The prophet says to the Jews: “Behold, a Virgin shalt conceive” (Isaiah 7:14); for Christians however, the saying devolves upon the fulfilling of the actual deed, the full treasure-trove of the actual event. In Judea a Virgin gave birth, but all the lands of the world accepted Her Son. There — was the root of the vine; here — the vine of truth. The Jews squeezed the wine-press, and the Gentiles have tasted of the sacramental Blood; those others planted the kernel of wheat, and these thrive by the grain harvest of faith. The Jews were pricked to death by the thorns, the Gentiles are filled by the harvest; those others sat beneathe the tree of desolation, and these — beneathe the tree of life; those expounded the precepts of the Law, but the Gentiles reap the spiritual fruits. The Virgin gave birth not Herself of Herself, but as willed He needing to be born. Not in corporeal manner did God act, not to the law of the flesh did God subordinate Himself, but the Lord of corporeal nature manifested Himself to appear in the world by a miraculous birth, in order to reveal His power and to show, that in having been made Man, He is born not as a mere man, — that God is made Man, since for His will nothing be difficult. On the present great day He is born of the Virgin, having overcome the natural order of things. He is higher than wedlock and free from defilement. It sufficed that He the preceptor of purity should shine forth gloriously, to emerge from a pure and undefiled womb. For He — is That Same, Who in the beginning did create Adam from the virgin soil, and from Adam without wedlock did bring forth for him his wife Eve. And as Adam was without wife before that he had a wife, and the first woman then was brought into the world, so likewise on the present day the Virgin without man giveth birth to That One, about Whom spake the prophet: “He — is Man, who is he that doth know Him?” The Man Christ, clearly seen by mankind, born of God, is such that womankind was needed to perfect that of mankind, so that perfectly would be born man for woman. And just as from Adam was taken woman, without impairment and without diminishing of his masculine nature, so also from woman without man was needed to bring forth a man, similar to the bringing forth of Eve, so that Adam be not extolled in that without his means woman should bring forth woman. Therefore the Virgin without cohabitation with man gave birth to God the Word, made Man, so that in equal measure it was by the same miracle to bestow equal honour to both the one and the other half — man and woman. And just as from Adam was taken woman without his diminishing, so likewise from the Virgin was taken the body (Born of Her), wherein also the Virgin did not undergo diminishing, and Her virginity did not suffer harm. Adam dwelt well and unharmed, when the rib was taken from him: and so without defilement dwelt the Virgin, when from Her was brought forth God the Word. For this sort of reason particularly the word assumed of the Virgin Her flesh and Her (corporeal) garb, so that He be not accounted innocent of the sin of Adam. Since man stung by sin had become a vessel and instrument of evil, Christ took upon Himself this receptacle of sin into His Own flesh so that, the Creator having been co-united with the body, it should thus be freed from the foulness of the enemy, and man thus be clothed in an eternal body, which be neither perished nor destroyed for all eternity. Moreover, He that is become the God-Man is born, not as ordinarily man is born — He is born as God made Man, manifest of this by His Own Divine power, since if He were born according to the general laws of nature, the Word would seem something imperfect. Therefore, He was born of the Virgin and shone forth; therefore, having been born, He preserved unharmed the virginal womb, so that the hitherto unheard of manner of the Nativity should be for us a sign of great mystery. On this great day people, leaving off from their arduous and serious affairs, do come forth for the glory of Heaven, and they learn through the gleaming of the stars, that the Lord hath descended to the earth to save His creation. The Lord, sitting upon a swift cloud, in the flesh wilt enter into Egypt (Isaiah 19:1), visible fleeing from Herod, on that very deed which inspires the saying by Isaiah: “On that day Israel wilt be third amidst the Egyptians” (Isaiah 19:24). In order not to stretch out in length our discourse and briefly to conclude what is said, we shall ask: in what manner was the passionless Word made flesh and become visible, while dwelling immutably in His Divine Nature? But what shall I say and what declare? I see the carpenter and the manger, the Infant and the Virgin Birth-Giver, forsaken by all, weighed down by hardship and want. Behold, to what a degree of humiliation the great God hath descended. For our sakes “impoverished, Who was rich” (2 Cor 8:9): He was put into but sorry swaddling cloths — not on a soft bed. O poverty, source of all exaltation! O destitution, revealing all treasures! He doth appear to the poor — and the poor He maketh rich; He doth lay in an animal manger — and by His word He sets in motion all the world. He is wrapped in tattered swaddling cloths — and shatters the bonds of sinners having called the entire world into being by His Word alone. What still should I say and proclaim? I see the Infant, in swaddling cloths and lying in the manger; Mary, the Virgin Mother, stands before it together with Joseph, called Her husband. He is called Her husband, and She — his wife, in name but so and seemingly wedded, though in fact they were not spouses. she was betrothed to Joseph, but the Holy Spirit came upon Her, as about this the holy evangelist doth speak: “The Holy Spirit shalt come upon Thee, and the power of the Most High wilt overshadow Thee: and He to be born is Holy” (Lk 1:35) and is of the seed of Heaven. Joseph did not dare to speak in opposition, and the righteous man did not wish to reprove the Holy Virgin; he did not want to believe any suspicion of sin nor pronounce against the Holy Virgin words of slander; but the Son to be born he did not wish to acknowledge as his, since he knew, that He — was not of him. And although he was perplexed and had doubts, Who such an Infant should be, and pondered it over — he then had an heavenly vision, an Angel appeared to him and encouraged him with the words: Fear not, Joseph, son of David; He That shalt be born of Mary is called Holy and the Son of God; that is: the Holy Spirit shalt come upon the Immaculate Virgin, and the power of the Most High wilt overshadow Her (Matthew 1:20-21; Luke 1:35). Truly He was to be born of the Virgin, preserving unharmed Her virginity. Just as the first virgin had fallen, enticed by Satan, so now Gabriel bears new tidings to the Virgin Mary, so that a virgin would give assent to be the Virgin, and to the Nativity — by birth. Allured by temptations, Eve did once utter words of ruination; Mary, in turn, in accepting the tidings gave birth to the Incorporeal and Life-Creating Word. For the words of Eve, Adam was cast out of paradise; the Word, born of the Virgin, revealed the Cross, by which the thief entered into the paradise of Adam. Though neither the pagan Gentiles, nor the Jews, nor the high-priests would believe, that from God could be born a Son without travail and without man, this now is so and He is born in the body, capable to endure suffering, while preserving inviolate the body of the Virgin. Thus did He manifest His Omnipotence, born of the Virgin, preserving the virginity of the Virgin intact, and He was born of God with neither complication, travail, evil nor a separation of forsaking the immutable Divine Essence, born God from God. Since mankind abandoned God, in place of Him worshipping graven images of humans, God the Word thus assumed the image of man, so that in banishing error and restoring truth, He should consign to oblivion the worshipping of idols and for Himself to be accorded divine honour, since to Him becometh all glory and honour unto ages of ages.